Just repeating what I said in the PaulyG Con thread in case other have anything to say about it. I'd sure be interested to find out if others enjoyed it as much as I did. 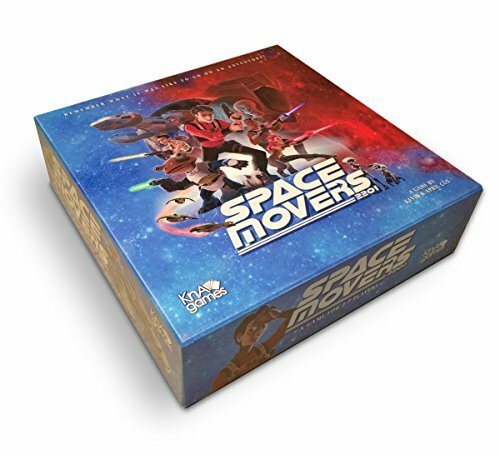 Space Movers was probably my Game of the Con. 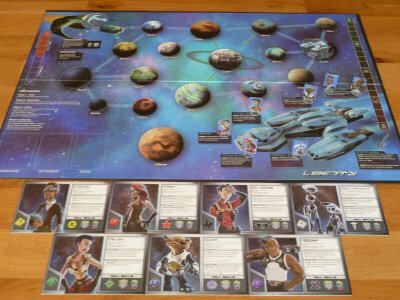 My expectations were low: the last Kickstarted game I played that came with a comic-book was Sentinel Tactics, which I freaking hated, and from what else I knew Space Movers was just a simple co-op space trading game with a dexterity gimmick — which all turns out to be true. That dexterity gimmick, though, was delicious: you each have a dice which you roll in an attempt to pass a challenge, and after players groan at and ridicule the terrible dice rolls of their allies they are allowed to fling their own dice at already rolled dice to try and change the result. This weird co-operative dice throwing thing works so well. For one, even though you might work out the strategies as a hivemind and you only have partial agency in your own turns, it is you alone that has to make the dice throws that could help or hinder the dice rolls of all other players. There is somehow a greater sense of team spirit in this silly dice throwing minigame than in whole other games that call themselves "co-operative". On top of which there is the element inherent to all dexterity games which is that physics will often enough make a complete fool of you for the hilarity of the whole table, such as accidentally hitting a dice with a good result and turning it into an injury for one of your teamates, or, say, just missing the box entirely (an instant fail to whatever the roll was for). The board art looks great and the layout works well: in one area we have the ship, where your crew scuttle around to different areas to take actions — a particular character might be better at the action in one location, making that their comfort area or designated station on-board, though they'll often have to abandon their post, usually to the kitchen, to assist another character, which all feels quite thematic — and everywhere else is the wide galaxy, where you will move the ship as a whole to important planets. There is one weirdly specific thing that transformed these two maps into an immersive space for me, and that was the drone, that launches from the drone bay at the back of your ship, lands on a planet to pick up goods, and makes it's way back to its home when the mission is complete — the image of the guy in the drone bay piloting the drone back from deep space through an opening back into the ship came readily into my head, connecting these two boards as one cohesive setting. I don't know why, it just felt important! Admittedly we got at least one rule wrong — that the UO ship should move every turn — so I shouldn't comment too much on the mechanics as they game might play quite differently if you follow the rules, but I'd say I got enough of the flavour to say I really like it. We'll definitely have to play this again.